We are now entering the longer water line hulls that allow the paddler to venture that bit further on their kayaking adventures - these kayaks are faster and offer more storage options to the paddler allowing them to spend longer on the water in comfort - Package prices include paddle and backrest. 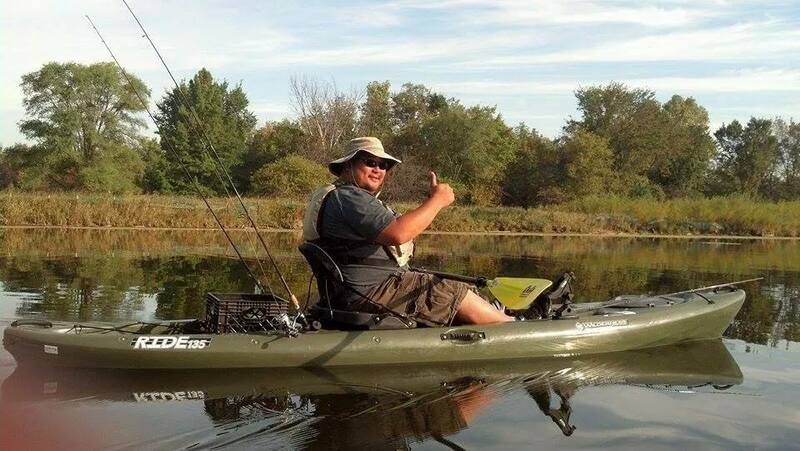 Vikings Profish 400 is a light weight kayak that is easy to handle off the water and on the water it's efficient yet stable hull covers ground quickly - it has a sharp bow and low profile deck designed to cut through oncoming chop whist offering minimal wind resistance - These combined with it's ample stern tankwell that can accept optional storage pod, two hatches and central console makes the Profish 400 a popular coastal touring sit-on. Other features include - scalloped sides for easy paddle strokes - sliding footrests - side paddle park - bow bungee - molded in side handles - All these and six rod holders as standard just in case you want to try some fishing ! Perception's Triumph 13 has a small jump seat for a small passenger - With it's high volume, large tank well and plenty of storage in the front hatch it is well suited to larger paddlers who may want to bring plenty of gear with them on a trip - other features include - central hatch with mesh bag - molded in side handles for easy lifting - a side paddle park - a cup holder - a central raised console to accept additional accessories. Tootega's 135 is a good touring sit-on with plenty of storage - it's biconcave rockered hull offers exceptional stability and copes very well with coastal conditions and surf waves - Features include - large stern tankwell with bungee - molded in side handles - side paddle park - central screw hatch with mesh bag - large oval bow hatch - bow bow bungee - The 135 is also a great angling platform and it's deck is designed to receive rod holders and additional angling accessories - A nice option for those looking for a good coastal touring sit-on with good volume. The RTM Disco is as close as you will get to reaching the performance of a sit-in touring kayak - It's sleek hull glides effortlessly through the water whilst it's sharp bow cuts through oncoming chop - The sea kayak style front hatch and the netted stern well can take ample gear - other features include a bow deck bungee, molded in side handles and optional rod holders. All in The Disco is a nice touring option for the more experienced paddler looking to cover ground and improve their kayak skills. The fourteen foot Tarpon 140 glides through the water with ease whilst it's stable double chined hull gives it's paddler great confidence - Standard features include - an over sized stern tankwell - four slide trax accessory rails - fully adjustable comfortable seating - 2 gear mesh pockets - central hatch - sliding footrests - large oval bow hatch - central raised console - 2 paddle parks -With good storage, great comfort and the well featured Tarpon deck, The 140 is a nice touring kayak for varied water conditions. The Wilderness Ride 135 big brother to the 115 offers the same pontoon hull stability and comfort but with more carrying capacity and storage. A great kayak for the larger paddler who wants to bring plenty of gear with them and is happy to compromise a little speed for added stability. Features include - a large stern tankwell - raised sliding seat- 2 slidetrax deck accessory rails - 1 central hatch and 1 large oval bow hatch - sliding footrests - paddle park and central raised console for accessories. The Islander Strike is a pontoon hull form sit-on with a narrow beam and therefore offers it's paddler good stability without loosing too much efficiency - With it's comfortable seating and ample storage the Strike has a lot to offer the shorter trek paddler.